BOURNEMOUTH, England (AP) — Chris Smalling and Romelu Lukaku scored as Manchester United earned a routine 2-0 win at Bournemouth on Wednesday to strengthen its grip on second place in the Premier League. Smalling netted his third goal in six league games by meeting a low cross from Jesse Lingard and slotting into an empty net in the 28th minute. Lukaku then sealed the win in the 70th after coming off the bench and running onto a through-ball from Paul Pogba and finishing with a first-time shot. 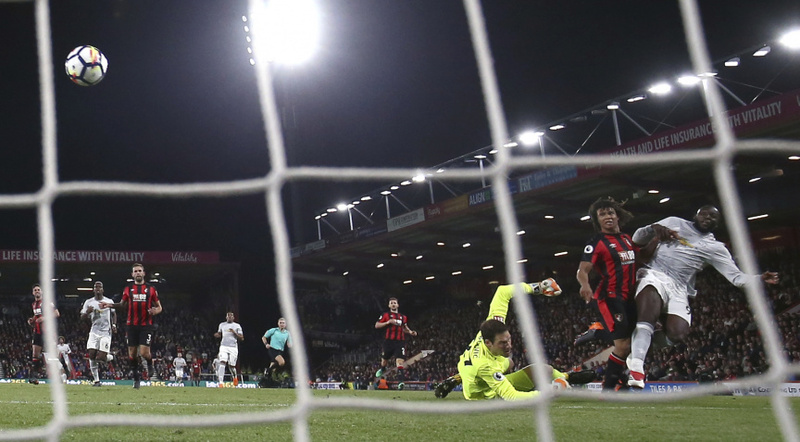 Bournemouth were denied a penalty shortly after the halftime break when Luke Shaw held on to Callum Wilson as the striker tried to reach a cross from Josh King, but referee Graham Scott waved away the appeals. It was a much-needed win for United, which lost 1-0 at home to West Bromwich Albion on Sunday to hand the league title to crosstown rival Manchester City. It keeps Jose Mouinho's team four points above third-place Liverpool and rebuilds some momentum going into Saturday's FA Cup semifinal against Tottenham. Mourinho made seven changes from the West Brom loss with that semifinal in mind, keeping Alexis Sanchez and Lukaku on the bench. And he said this performance will give him a selection headache on Saturday. "It was a good team performance, professional, controlled, good effort, good responsibility," Mourinho said. "I would say that every player on the pitch was positive and put himself available for Saturday."